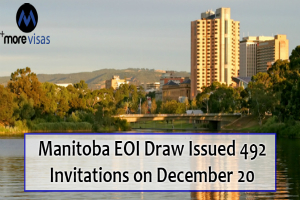 In the 2nd Expression of Interest draw conducted in December, Manitoba announced a sum of 492 ITA's for the provincial nomination. The applicants who obtained Letters of Advice to Appeal (L.A.A's) in the Dec 20 draw related to Skilled Workers Overseas, Skilled Workers in Manitoba, and International Education streams. Out of the entire 492 invitations announced, 351 were announced by the Stream of Skilled Workers Overseas and further 106 invitations were announced to the candidates of Skilled Workers in Manitoba. The outlasting 35 invitations were announced to applicants of the current Stream of International Education Manitoba. Skilled Workers Overseas applicants were expected to have the least score of 576 while the least scores needed for Skilled Workers in Manitoba was 502. With the current draw, the entire number of LAAs issued by M.P.N.P in Dec has reached 1,022. With the Skilled Workers Overseas applicants invited on Dec 20 are an unknown number of candidates in Express Entry. The Manitoba PNP had invited applicants by its pathway of Express Entry in the early draw conducted in December as well. To be counted for an invitation for Manitoba provincial nomination from M.P.N.P, the Express Entry applicants must have a minimum of 06 months’ experience in one of the in-demand professions of Manitoba and a job seeker validation code. Those who strongly apply for a Manitoba provincial nomination will earn 600 extra CRS score points that would assure them an invitation to apply for Canada permanent residence in the following Express Entry Draw. Besides, Manitoba province also announced 44 L.A.A's to Skilled Workers Overseas applicants an Initiative of Strategic Recruitment. The lowest demanded score was 718.